It's Love At First Stitch! Can you really love a sewing machine? Well, that's a silly question! You know what I mean. Most of us have multiple machines. And you know I love them all--each for different reasons or maybe, for different tasks. I just love the hum of the machine. Well, we have a new love at the shop. We loved this new brand of sewing machines at Spring Market! When this machine was announced this summer we were so impressed. And when one of our customers mentioned she was interested in a lighter weight machine for classes, retreats and sew-ins we thought this might be just the thing. 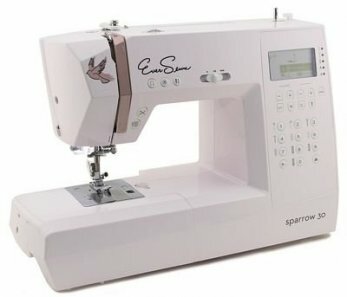 The Sparrow 30 is the new "top of the line" machine from Eversewn (a division of Bernina!) and comes with 310 stitches including 2 alphabets, needle down button, start/stop button, automatic needle threader and thread cutter. It comes with an extention table, too. It weighs in at 14 pounds and is even made on a medal frame. What's not to love! Did I tell you it is blush pink with rose gold accents? So, if you have that "itch" for a new machine or just want to check it out come on in. Price is $460. And yes, it was love at first stitch. Congratulations to Ruth Kindall on her purchase of our first Sparrow 30! She was in the shop yesterday with the charity sewing group and she has named it. "Birdie" has a new home! Click to visit the White Flower Quilt Shop!